A perfect Summer dessert, this one is no-bake, make ahead friendly, easy and delicious. Change up the fruit as you go through the summer. Great with raspberries, strawberries, blueberries or peaches! 1 pint blackberries or raspberries etc. Prepare the crust by combining the candied pecans, coconut and melted butter in a food processor. Pulse several times until mixture is crumbly and combined. Divide the crust mixture between 8 jars or glass cups. Set aside. 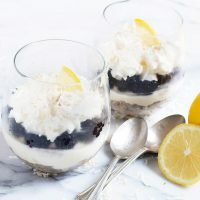 Prepare the filling by combining the mascarpone, cream cheese, icing sugar, whipping cream, lemon zest and lemon juice in the bowl of a stand mixer with a paddle attachment (or a large bowl with electric beaters). Beat until light and fluffy, about 3 minutes, scraping down the sides of the bowl as needed. Divide the lemon cream filling between the 6 cups. Top cups with a layer of blackberries. If making ahead, cover with plastic wrap and refrigerate until ready to serve. Toast the coconut for the topping by adding to a non-stick skillet and cooking over medium heat, stirring constantly, until golden. Immediately remove to a plate (to stop cooking). Allow to cool completely. Store at room temperature covered, until ready to use. To serve, top cups with a dollop of whipped cream and a sprinkling of toasted coconut.